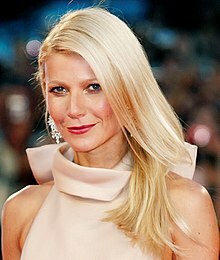 Gwyneth Kate Paltrow (/ˈɡwɪnᵻθ ˈpæltroʊ/; born September 27, 1972) is an American actress, sangster, an fuid writer. ↑ "Gwyneth Paltrow". People.com. Retrieved 18 March 2013. This page wis last eeditit on 9 September 2018, at 12:02.